A book for nurses, doctors and all who provide end of life care, this essential volume guides readers through the ethical complexities of such care, including current policy initiatives, and encourages debate and discussion on their controversial aspects. Divided into tow parts, it introduces Divided into two parts, it introduces and explains clinical decision-making processes about which there is broad consensus, in line with guidance documents issued by WHO, BMA, GMC, and similar bodies. The changing political and social context where 'patient choice' has become a central idea, and the broadened scope of patients' best interests, have added to the complexity of decision-making in end of life care. The authors discuss issues widely encountered by GPs, nurses, and hospital clinicians. These include patient choice, consent, life-prolonging treatment, and symptom relief including sedation. 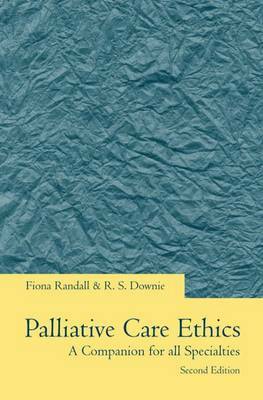 Part tow explores the more controversial current end of life care initiatives, such as advance care planning, preferred place of care and death, euthanasia and assisted suicide, extended ideas of 'best interests', and the view that there are therapeutic duties to the relatives of patients. Throughout their discussion the authors draw attention to loose ends and contradictions in some of the proposals. Examining the current policy of consumerist choice, they reject its place in the health service, proposing a realistic, fair, humane and widely adoptable system of end of life care. As knowledge of ethical theories is required in training courses, and the vocabulary of ethical theory is widespread in current discussions, a substantial appendix on ethical theories and terms is available online. Written by the same authors as The Philosophy of Palliative Care: Critique and reconstruction, which won the Medical Journalists' Association Specalist Book Award 2007, this new new book for non-specialists is essential reading for all health care professionals involved in providing end of life care.